The Vikings selected Western Michigan offensive tackle Willie Beavers with their fourth round selection. In his first interview with the media, Beavers says he can provide versatility to the Vikings' offensive line depth chart. The Vikings traded away their third round selection on Friday night, but got back into the game on Saturday afternoon by selecting offensive tackle Willie Beavers out of Western Michigan in the fourth round. At 6'5", 309 pounds, Beavers started every game in 2015 at left tackle. The Western Michigan running game tallied 204.6 yards behind his offensive line unit last season. Beavers was named 2015 All-Mac First Team. 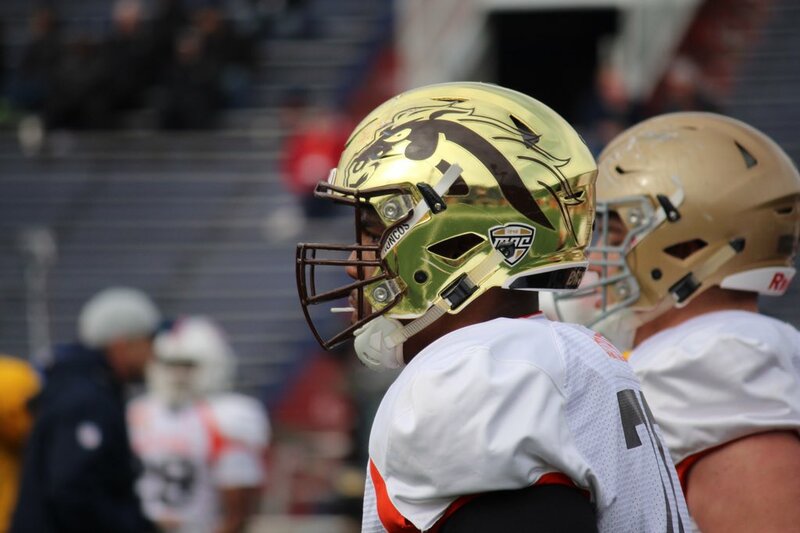 He played in both the Reese's Senior Bowl and the East-West Shrine Game and started every game since his sophomore year at Western Michigan. In his first media appearance, Beavers was very thankful for the opportunity to play for the Minnesota Vikings organization. "I just want to thank the Vikings for believing in me," Beavers said. He provides depth for the Vikings' offensive line unit that will be evaluating a variety of offensive lineman in offseason workouts. Beavers could play both guard and tackle in Minnesota because he has versatility. Beavers isn't exactly sure how he'll be used in Minnesota, but he did stress his versatility. "No, I'm not sure. Like at the Senior Bowl, I showed my versatility, so wherever they put me on the offensive line, I will be good," Beavers stressed. On tape, Beavers is a very athletic player who has the size to play at the next level. However, he knows being smart and getting stronger will be two areas he needs to improve upon as he transitions to the NFL. "I know at the next level a lot of guys are much bigger and stronger, so I just need to get stronger and bigger and just pick up on things and stuff. Becoming a student of the game and just learning and picking up a lot of stuff," Beavers explained. Beavers seemed most excited to be working with the Vikings' coaching staff, specifically new offensive line coach Tony Sparano. Beavers met with Sparano at both the NFL Scouting Combine and the Reese's Senior Bowl. "They're all awesome guys," Beavers said. "I got the chance to meet with the offensive line coach at the combine and the Senior Bowl and he's an awesome dude. I can't wait to get to work for him." Beavers' long wingspan and size are both attractive attributes of his game. He provides more competition to an offensive line unit the Vikings have invested a strong amount of money into this offseason. The Vikings now have 16 offensive lineman on their roster, so the competition will be stiff for the incoming rookie. Beavers might be a developmental project, but he has the flexibility to move across multiple positions on the offensive line. A competition among this position group was something head coach Mike Zimmer strongly reiterated entering the offseason. Adding Beavers increases that idea of competition in the room and brings more versatility to a Vikings offensive line that struggled mightily in 2015.